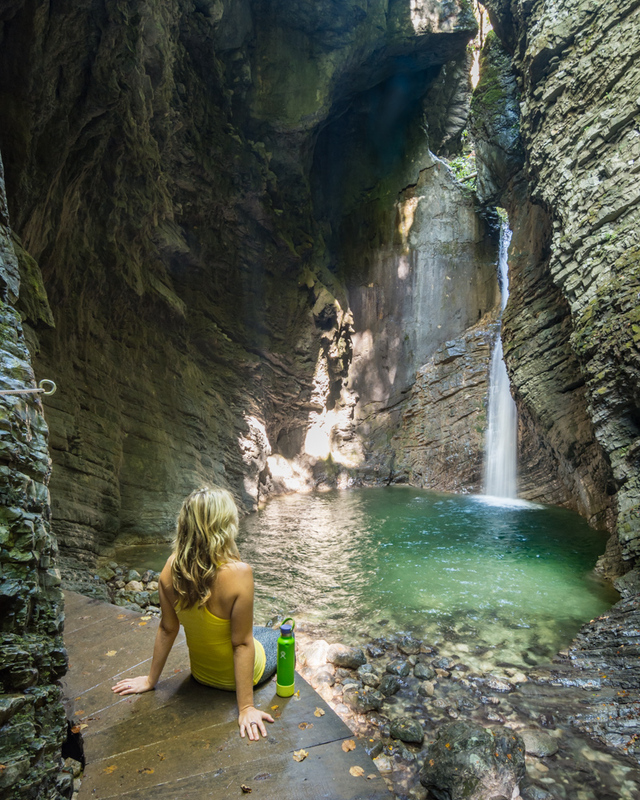 With beautiful alpine meadows, picture-perfect lakes, stunning glacier valleys, deep limestone gorges, and seemingly endless waterfalls, Slovenia is a hikers paradise! Most major trails are well maintained and clearly marked so hikers of all experience levels can explore this vast wonderland. 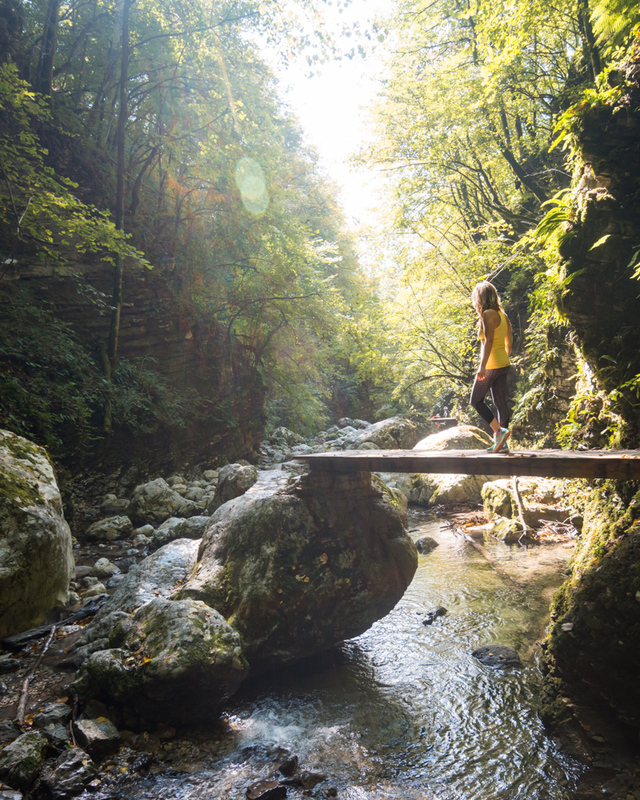 We’ve compiled a list of our top 6 favorite short hikes in Slovenia to get you started! Arriving at the parking lot you’ll pay your entrance fee and then set off down the picturesque gorge with moss and fern covered limestone walls. Where the gorge becomes too narrow wooden walkways cling to the towering walls with the turquoise water cascading beneath your feet. You’ll pass numerous small waterfalls and rapids as well as a man-made hydro-electric dam. Don’t forget to look up at the stone railway bridge 100 feet over your head – it was built in 1906! 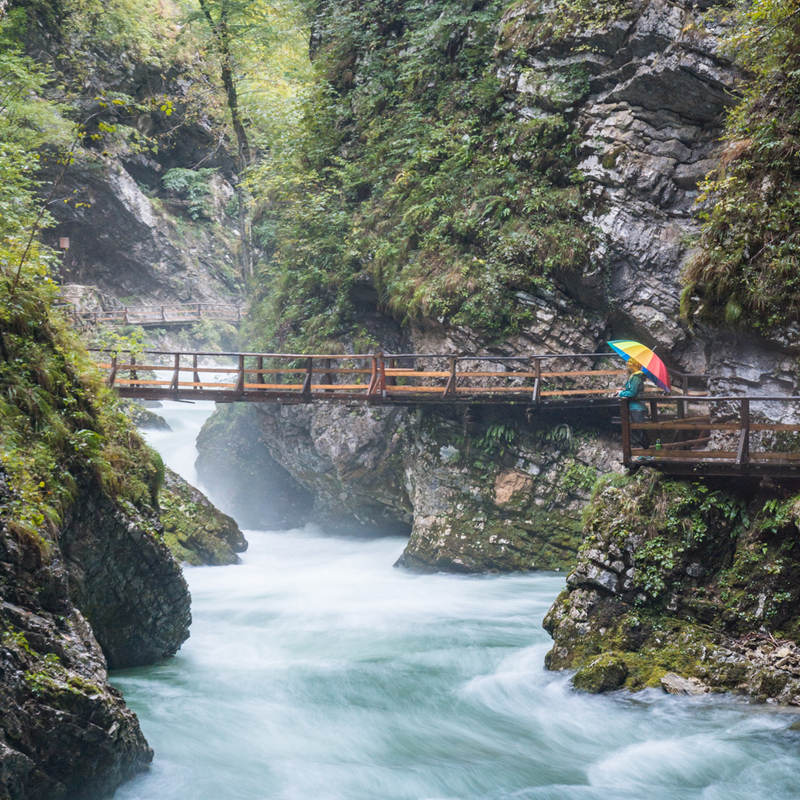 The hike ends with a suspension bridge over the impressive 40′ high Šum Waterfall. For the best view you’ll want to descend the stairs behind the ticket office and cross the river to a viewing platform at the base of the falls. Ljubljana, Slovenia - The Little City That Packs a Big Punch! The trail for Peričnik Waterfall starts from a gravel parking lot 2.5 miles south of Mostrana at the ‘Koča pri Peričniku’ hut (where you’ll be asked to pay the 2€ parking fee). 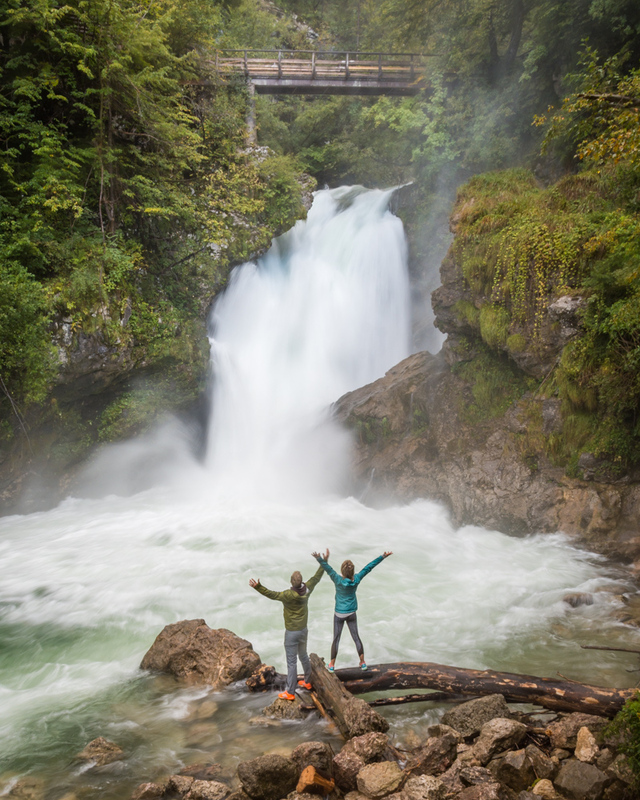 Climb up the steep but well-maintained trail to a small wooden bridge that crosses in front of the base of the falls. 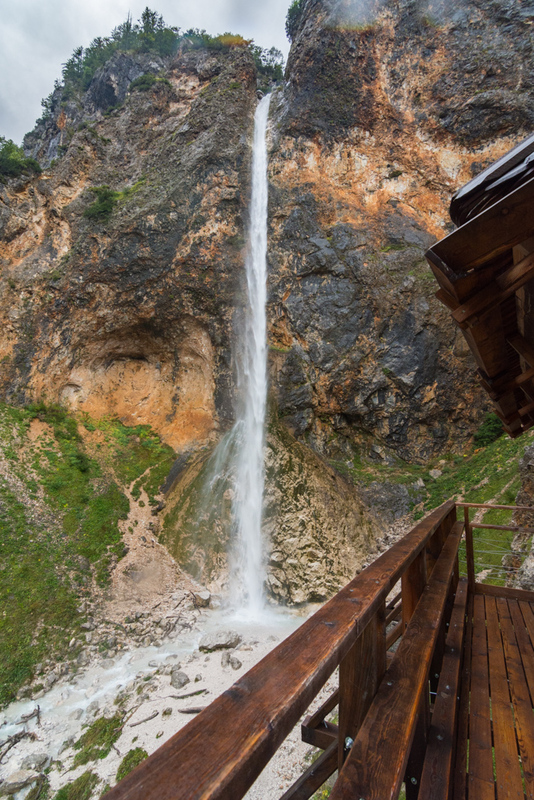 Here you’ll get your first good look at the breathtaking 170′ Peričnik falls. Stop on the bridge for a quick picture but don’t turn around just yet – the fun is just getting started! Continue across the bridge to the opposite side of the falls and up the steep bank. From here you can hike under the massive overhang and behind the waterfall! You’ll encounter spray from the waterfall and the overhang drips constantly so bring an umbrella or be prepared to get wet. 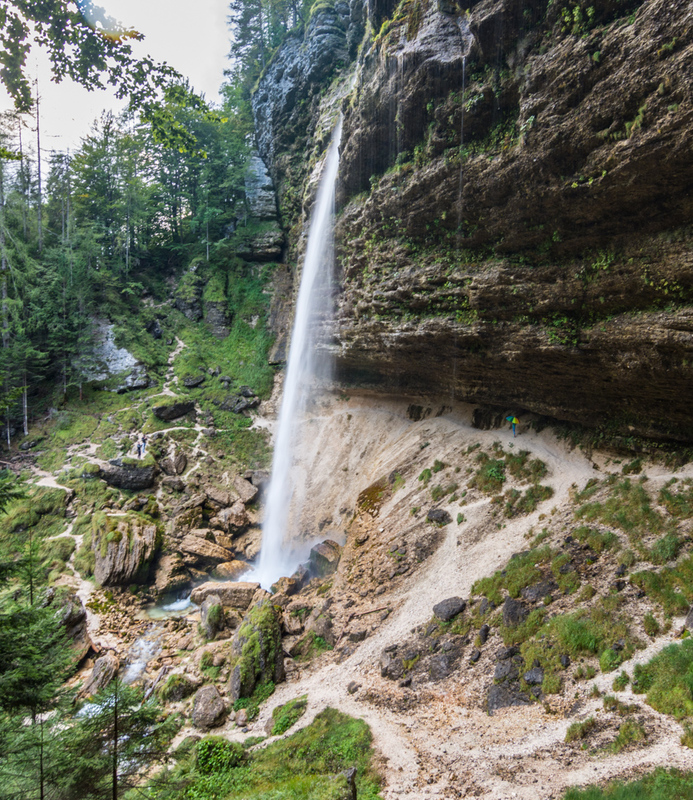 If you’re feeling particularly spry you can continue on up a steep path to an upper, much less visited 50′ waterfall (Upper Peričnik Waterfall). Once you’re finished taking in the falls head down the trail to the right of the falls to make it a loop. If you’re looking for one of the best short hikes in Slovenia then look no further! Just outside of the town of Kobarid you’ll find this pleasant stroll along the east bank of the Soča River. Park in the gravel lot across the road from Kamp Koren and follow the signs for the Kobarid Historical Trail. You’ll start off walking through a large pasture and pass some beehives on your right before entering the woods. On your left you’ll have beautiful views of the bright bluish-green Soča River and soon you’ll come to a suspension bridge crossing over the Soča. The 170′ long bridge is actually fairly new (it was built in 1998) but the wooden supports in the center look like they were cobbled together before the age of modern engineering. That just adds to the excitement of this trek. Pop out on the bridge for a quick picture but then continue on along the east bank of the Soča and a few hundred feet later the trail turns right to follow the Kozjak River. 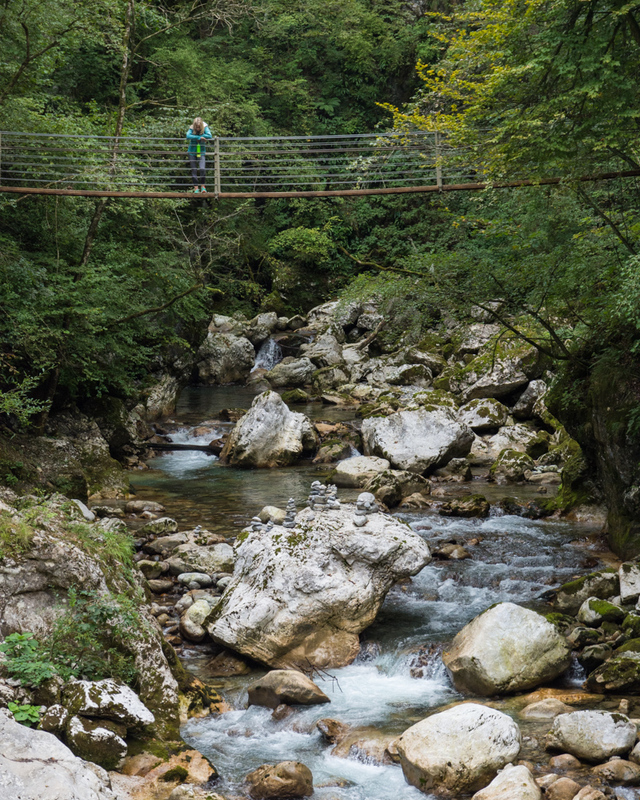 You’ll crisscross the river on wooden bridges and walkways as you continue up the Kozjak River Valley. The valley narrows with limestone walls rising up on both sides and the trail ends with a set of wooden walkways climbing up the steep walls on the left hand side of the river. Just around this final bend you’ll reach a viewing platform where the 50′ Kozjak Waterfall drops into a blue-green pool surrounded by an amazing natural limestone amphitheater. On you’re way back to the car, if the weather is warm, head down a side trail on the right to the bank of the Soča River to soak up the sun and take a dip in the refreshing water. Then, after your swim, head back up to the main trail and cross the suspension bridge to the west bank of the Soča. Head up the hill to the bike path, take a left and follow the path south to the Napoleon Bridge. Cross the bridge and you’re back at where you began! 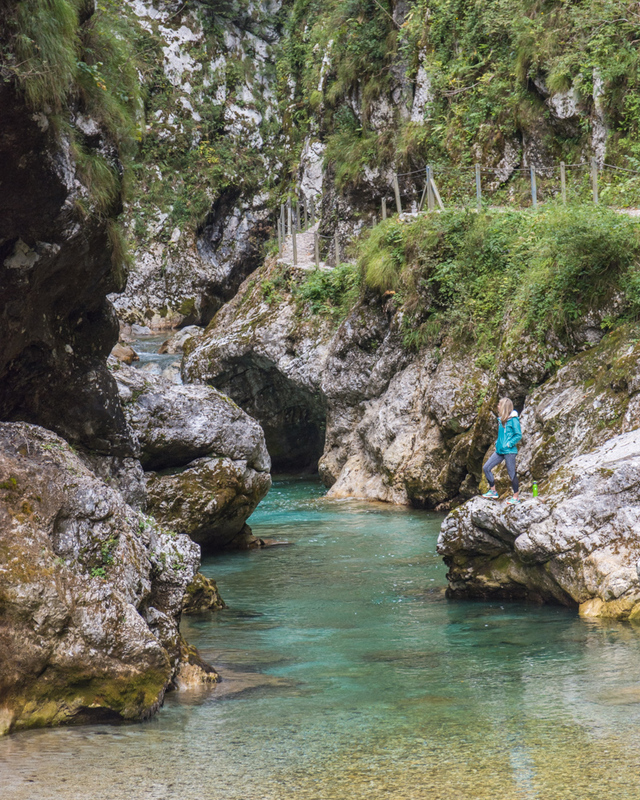 This well-maintained, easy hike starts in a gravel parking lot about a mile north of the town of Tolmin. When you pay the entrance fee at the small ticket stand you’ll be provided with a map and explanation of the hike. Start by descending the stairs down to the confluence of the Tolminka and Zadlaščica rivers. Fun fact, this is lowest point in Triglav National Park and the only confluence of two gorges in all of Slovenia! Cross the wooden bridge to the opposite bank of the Tolminka River and head upstream. Much like Vintgar Gorge, this trail heads up the blue-green river with steep limestone cliffs on both sides. This section of trail ends in a small cave and a viewpoint of river snaking its way further up the narrow gorge. You can’t go any further here so turn around, head back to the confluence, and take a left to head up the stairs along the Zadlaščica River. Pop out onto the suspension bridge for a birds-eye view of the two rivers and then continue heading up the Zadlaščica Canyon. This section consists of a long set of stairs (supposedly around 500 of them). Soon you’ll come to a 2 viewing platforms above a large boulder lodged between the canyon walls that has been nicknamed “The Bears Head” (‘Medvedova Glava” in Slovenian). The viewing platforms extend precariously out over the canyon providing views of the river and several small waterfalls far below. Double back and continue up the stairs until you reach the paved road. From here turn right and head up hill to Dante’s Cave. The cave system is over a half mile long but you’ll need a professional guide to go exploring beyond just a quick peek inside the entrance. Now head back down the paved road crossing the Devil’s Bridge high above the Tolminka river. The paved road will lead you right back to the ticket booth and the gravel parking lot you started from. Logar Valley is an incredibly beautiful glacier valley situated near the Slovenia-Austria border. After entering Logar Valley drive the 4 miles to the end of the road and park. From here follow the trail up the valley and a handful of switchbacks. This path is fairly steep and rocky so be prepared for a workout! You’ll soon emerge at the base of Rinka Falls which at a height of 344′ is the highest waterfall in Logar Valley. From here you can climb the stairs up to a darling little cafe with a viewing platform. Make sure you try a shot of their delicious blueberry brandy! After a fruity alcoholic cheers to your accomplishment head back down the trail to the parking lot (good thing it’s a short hike back!). 6 Amazing Things to do in Slovenia! 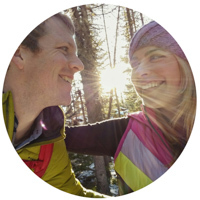 The expansive views that this hike offers start on the drive up! From Tolmin, head southwest up winding mountain roads towards Italy, stopping at all of the viewpoints along the way. When the road splits, keep to the right (the other road takes you across the border into Italy). At the road’s highest point you’ll see an information board, a small souvenir stand, and a pull-out that is large enough for a handful of vehicles. 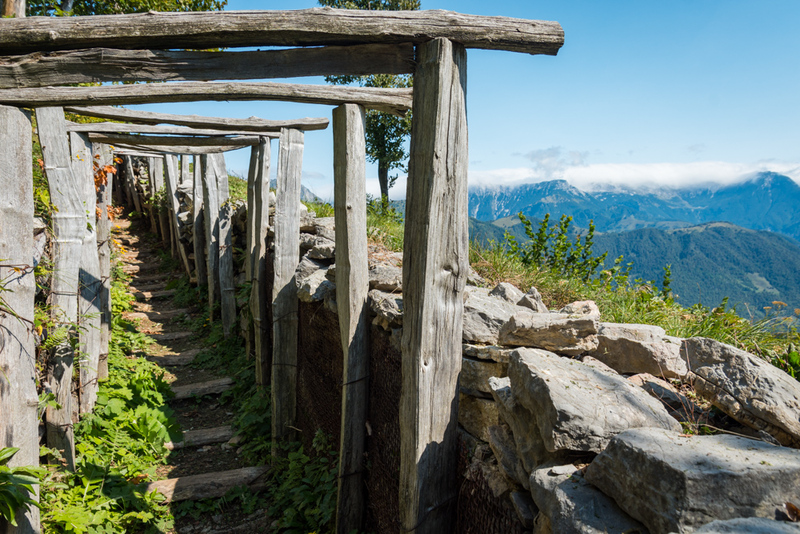 During World War I the Italian army built an extensive system of bunkers into the hillsides which have been preserved and are now a part of the Kolovrat Open Air Museum. Take your time exploring the maze of bunkers and then continue up the path to the top of the hill. Here you’ll be greeted by a white stone marker designating the Italy-Slovenia border and epic views on both sides. On a clear day you can see the massive mountain peaks of Triglav National Park to the north and all the way to the Adriatic Sea to the south! 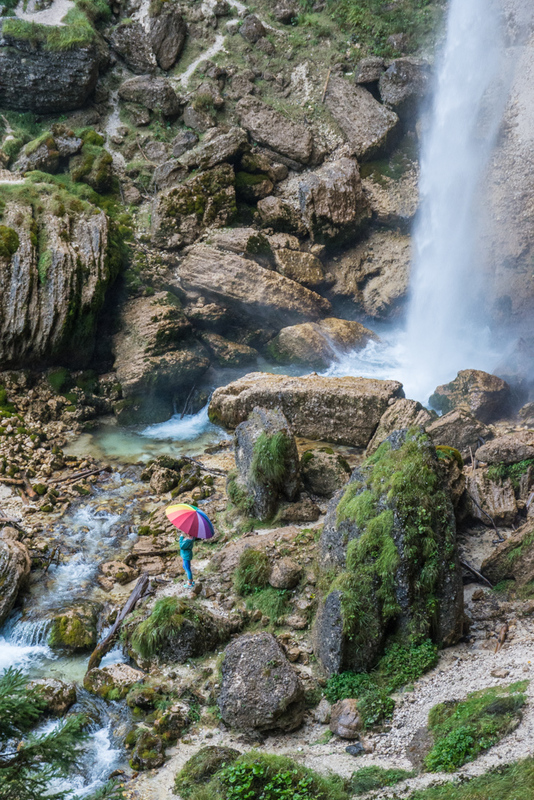 So that’s a wrap of our 6 favorite short hikes in Slovenia! 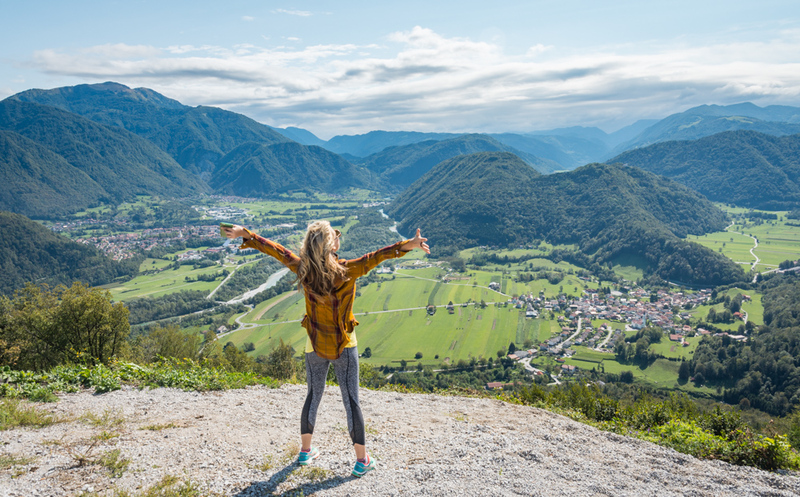 You’ll find a handy map below so you can hike them all during your Slovenian vacation! Looking for more information on hiking in Slovenia? Try these resources! Ljubljana, Slovenia – The Little City That Packs a Big Punch! Previous Post 6 Amazing Things to do in Slovenia!